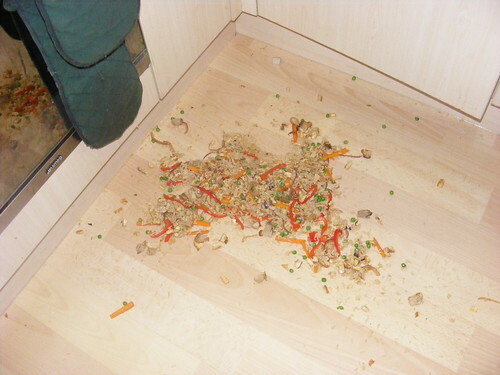 It turns out a wok full of fried rice and veg is heavy. Lulz. We went out for curry instead. Normal Service will be resumed in 2 weeks. It’s less than 24 hours until I Do and then we’re off on honeymoon, which is most exciting. Once we’re back, normal service on this here blog will be resumed and there will be lots of new and thrilling recipes. See you then! I only just realised I’d set it so that only members of wordpress could comment on this site. Which wasn’t very friendly. So now I have set it so that anyone can. So if you could please do me a favour, and if you can read this, add a comment. And if you can’t comment for some reason, email me. I know you’re out there. I can see you. Tinned meat to make a bolognaise? What are you thinking? You’ve let your audience down, you’ve let the BBC down, but most of all, you’ve let yourself down. I have not died in a blogging accident. I am a terrible blogger and deserve to be punished for not updating sooner. Sorry. The fact is, I’m getting married pretty soon and I’m really busy organising stuff. We’ve booked the honeymoon now – Paris, Venice and Florence. Very exciting. But really, it’s no excuse for not writing up recipes, so please give me a kick up the arse for being so slack and I’ll be back on track very soon. I am totally proud of this pie. Look at it! Pie! 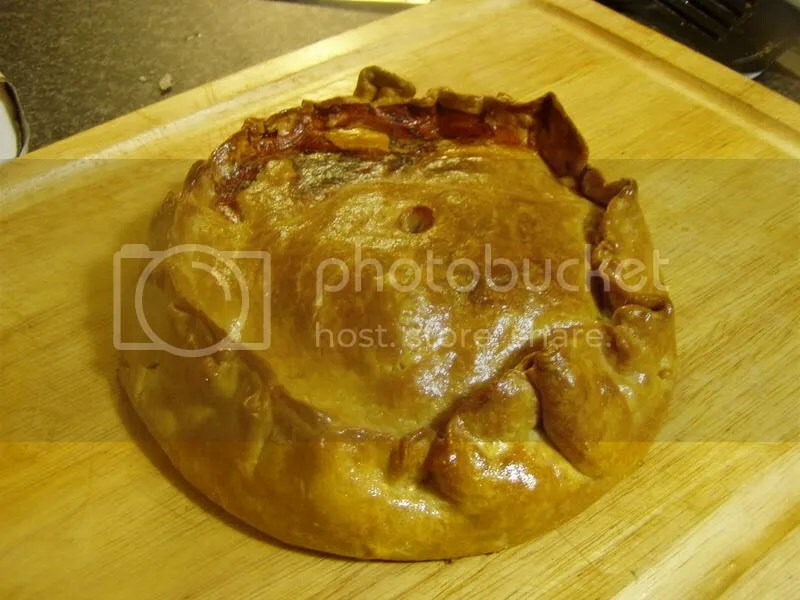 Pie of meat! I won’t lie to you – you’re not going to knock this up in half an hour. It takes a little patience, but it’s totally worth it. And the pastry, which is the thing that scares most people off, is really very easy. Hot water crust pastry is the easiest pastry I’ve ever worked with – it rolls out smoothly and has the texture of playdough. No worries. You could use other fillings – chicken, ham, pork, game, beef. Whatever you like. You will need a bowl or something with a diameter of about 15cm/6in. As you can see below, I don’t have an appropriately sized bowl (I never do) so I use a saucepan. But a bowl or dish would be better. You will also need some greaseproof paper and some clingfilm (saran wrap). First, you need to make the pastry. Cut the butter and lard into small pieces put them with the water into a saucepan and bring it to the boil. Meanwhile, sift the flour and salt into a large bowl and make a well in the centre. Put the beaten egg into the well and cover the egg with the flour (but don’t mix it all together). Pour the boiling water and fat around the edge of the bowl and then quickly stir everything together and a table knife. You need to kind of cut it all together, if that makes sense. It will come together quickly and once it’s cool enough knead the pastry together gently until it’s not streaky any more. Once this is done, wrap the ball of pastry in clingfilm and pop it in the fridge to rest and cool down for half an hour. Go and have a cup of tea. Now get your 15cm diameter bowl (or, if you’re me, saucepan) and wrap the [i]outside[/i] of it with clingfilm. You can now become a fan of this site on Facebook and spread the word. I don’t get paid any money for this blog you know. No adverts, see? It’s all about the fame.